Purple Musicians in the USA and World? Forums > General Discussion > Purple Musicians in the USA and World? 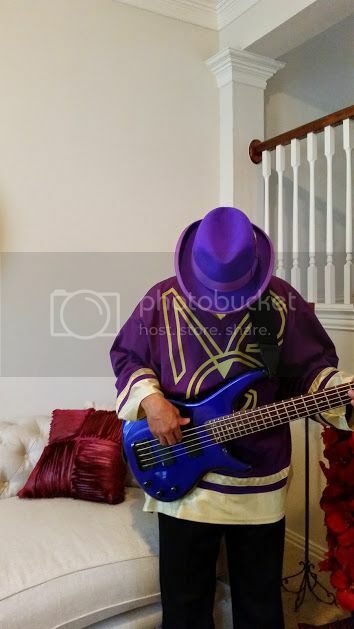 Do you know any Prince Purple Musicians? Big Prince Fans/Fams Musicians that know many Prince songs on their instrument or at least could learn them? You play guitar, right? In other instruments? About how many Prince songs you know? I play piano/keyboard. There isn't one Prince song that I can't play. Really? Wow! What kind of keyboards you have? I've got a Korg PA300 and a Roland VR-something-or-other. Can't remember exact model number. I've also got a Yamaha grand piano. Almost had to sell me car to pay for it. And I don't use it near as much as I thought I would have. I've never had such strong buyer's remorse. Guitar mainly. I know most of his songs and the ones I don't know are probably because I've never tried them out. He was such a phenomenal song writer. A person could do nothing but play Prince stuff the rest of their life and not miss out on a thing, IMHO. Cool. You play in a Band in Ireland, teach lessons, or just hobby now? You do most the Solos on point also? You have a Band in Houston? I'm not in any band or anything like that. I was signed to ZTT Records for a few years but things didn't work out. I had a baby soon after signing so I kind of prioritised my daughter over anything else. Besides, I just don't have the motivation to do anything like that anymore. I mostly play as a hobby now but sometimes I play on my friends' records. Cool that you still play as hobby though or on your friends records. I wish! When I say I play the songs, I mean mainly acoustic and/or rhythm. Most all of my playing is solo, so I work out the songs for that environment. Myself I am always sanging me some Prince, love the falsetto and the highs and lows.